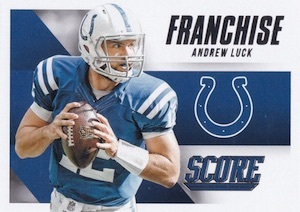 2015 Score Football gets back to basics (at least as far as modern Score sets go) with a low price tag, a big base set, and lots of inserts and parallels. Each box has one autograph or memorabilia card. The main set has 400 cards. In case you were wondering how Panini's acquisition of college licenses would integrate with their pro lines, this is it. Rather than showing rookies in generic uniforms like the set has over the past few years, first-year players are pictured in their college gear. 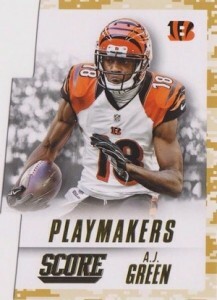 2015 Score Football has more than 100 rookie cards. There's no shortage of parallels, most of which mix colors and football monickers. They include: Showcase (#/99), Gold Zone (#/50), Artist Proof (#/35), Red Zone (#/20), First Down (#/10), End Zone (#/6) and Gem Masters (1/1). 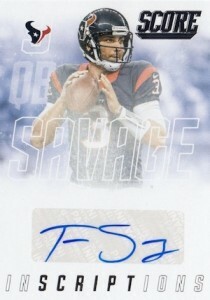 Rookie Signatures use a similar look and format to the base cards, complete with the plentiful parallels. Other autographs can also be found in Inscriptions. These bring veteran signatures to the product. 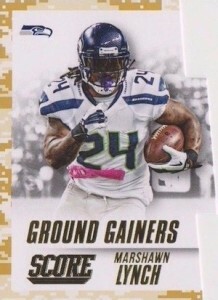 2015 Score Football has more inserts as well. 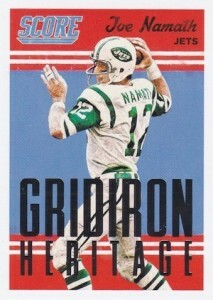 Gridiron Heritage attempts a throwback design with a checklist of retired players. Die-Cut Puzzle cards can be put together to make three-card lineups. These come in different themes. 2015 PANINI SCORE GOLD ZONE ROOKIE TAYLOR HEINICKE ODU PANTHERS RC #49 50! RONALD DARBY 2015 SCORE FIRST DOWN RC #432 SE#ED 05 10 SSP"Now With Eagles" GEM! 440 cards cards. Shop for base sets on eBay. 28 cards. Click here to see the variations. 106 cards. *Card #357 only found in parallels. All players not found in each parallel. View the spreadsheet for full checklist and specific print runs. I loved this product in 2013 because it was available in a Jumbo box. Please, Score, do that again! 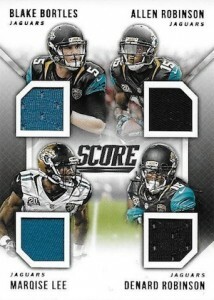 Looks so sick I’ll be buying a few hobby boxes for sure! Are the rookies in the college jerseys? Most of the team sets are already on eBay. When will the full checklist be released? I opened a 12 box case of the Fat packs yesterday. These are the rack packs mentioned above. Each box had 12 packs of 52 cards. First off the set has 440 cards, same as last year. The quality is great, well centered, sharp looking cards. Each pack had 7 inserts on average. 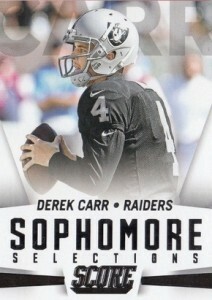 leaving 45 base and rookie cards per pack. Each pack contained only 6 rookies. So I have 7 complete sets and 8 sets of cards 1 to 330. 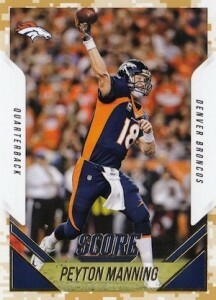 The above mentioned All-Pro and All-American cards are actually one insert set. 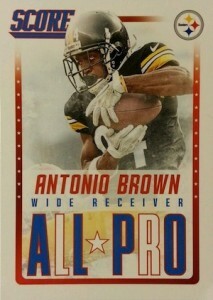 All-Pro numbered 1-15 and All-Americans numbered 16-20. Each pack contained one of these 20 cards and there aren’t parallels for these. Of the 144 of these I got, 68 have factory damage. A 3/4 inch long crease, in the top right corner. So I was unable to complete that set. I got 5 autographs (4 rookie) and 5 patches. All the patches were solid color, 3 single player, 1 dual player (different color for each player) and 1 quad patch (2 white, 1 orange and 1 navy). 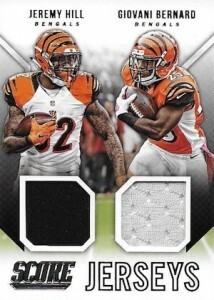 Also pulled one End Zone card #3/6. I found 3 Artist proofs #ed to 35 and about 18 Scorecards. The simply fact that the rookies in this set are actually in their college uniforms makes this product better looking than Bowman. The only things Bowman has over is a better hobby box configuration, even if all those autos may water down the secondary market, and the chrome cards that give it a more premium feel. For what it is this isn’t too bad of a product at all. The 12 card packs have giving about 3 rookies per pack – so they don’t seem to be short printed and because of inserts appear to be just a little more plentiful than the first 330 cards. Liked 2014 design a little better but like college uni’s used this year. Seemed to do better though with retail last year than this year so far. I actually went by my local cs & picked up a few hobby packs of it for the first time ever. Managed to pull DeVante Parker Red Zone Auto 14/20. Very pleased. Great website btw Ryan. My goto for everything. Thanks. Jeremy C � Thanks! I am just one part of a great team. Great cards and design at a reasonable price. 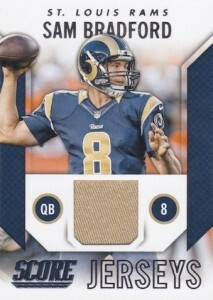 But if you are not a fan of rookie cards than stay away because there are a lot if them in the packs. Nice cards for the lower cost. Waiting for cardboard connection to list the variations. Bought 2 boxes. Box #1 was great, box #2 was a slight disappointment. But, still, for the cost how can one complain. All the rookies, inserts one can ask for. 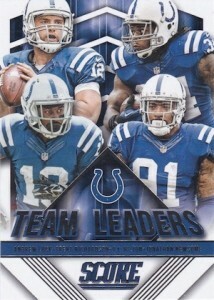 I absolutely LOVE these football cards! For the past few years, i loyally collect Topps football cards, but I decided to try these cards because Topps 2015 still hasn’t come out. The entire line of cards is fantastic! You get a ton of rookies, so its much easier to collect a complete set. 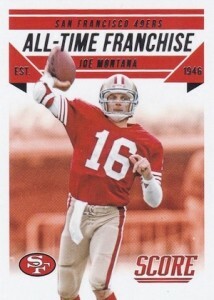 Also, there a ton of Special Cards to collect such as Gridiron Heritage (a throwback series with cards in a 1960’s design), Team Leaders, and All-Time Franchise, which has only 8 cards, so its easy to collect (also, who isn’t excited when they find a trading card for Joe Montana?) But my favorite part of this series is the Parallel Cards. Some are simple variations of color for the special cards, while others have as little as 6 cards! I actually pulled a First Down (#/10) Autograph card for the first-round Draft pick Andrus Peat! I love it! If anyone check out my website, you will NOT see that card, because I’m totally keeping it! Anyway, my point is that these are my absolute favorite trading cards on the market, and I’m so happy I stopped collecting Topps! I love what score has done. They made great cards for a reasonable price. 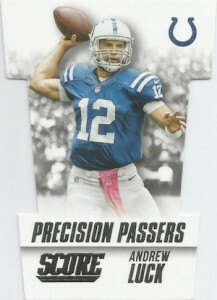 You get variations, rookies, inserts, #cards all for a great price. Beautiful photography. 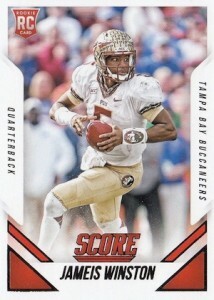 For a person who just wants to collect cards for the hobby I 110% suggest score football. 2015 Score FB is no different than what it is year after year. Low end, low cost, lousy base design, too many parallels, and some cool insert sets. Three stars easy. Judging by the comments I need to be buying 12 card packs to get caught up on the RC. Jumbos are not the way to go if you’re trying to build a complete set. Typical Score. That’s really all I have to say. If it’s good enough for Horse Beast, it’s good enough for you! Hello, I’m writing from France. I bought one hobby box that i receive this day. 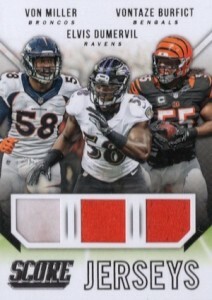 It’s sure that Score is not made to have big hits other Panini products. 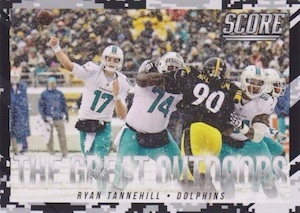 But I’m very satisfied of my box today: one rookie scorecard auto (Tony LIPPETT, Dolphins), one Score Jersey (Daniel Thomas, Dolphins, again !!! )…yes, two hits in the same box !!! No numbered parallels but lot of colored parallels, and all players of Green Bay Packers in base cards, my favourites !! I have bought at least one box of Score Football in the last four years, i think the 2015 edition is the best…but it’s just my opinion. It is late 2018, I bought a ton of packs very cheap recently. I would love to read more recent reviews. The cards are nice but plentiful like 1990 score or topps or upperdeck or proset…just concerned history is repeating itself. Card companies like our coin production in the USA should be made to show production on all cards.